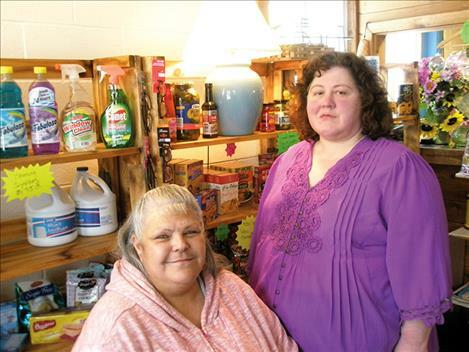 April Zimmerer, left, sits with May Simmons of New Hope Center Montana. A GoFundMe account was set up to help Zimmerer keep her Ronan home. POLSON – Helping a woman keep her house was just one example of the types of things that May Simmons does. Simmons opened New Hope Center Montana, a non-profit organization, at 610 N. Main St. in the former Glass Doctor building in September. When she found out that April Zimmerer was in danger of losing her home in Ronan to foreclosure, Simmons stepped up and started a GoFundMe page. The page raised $1,820, which Zimmerer said she used to pay the property tax for 2016. Then a friend stepped forward to loan Zimmerer the remaining funds necessary to pay off her second mortgage. Zimmerer, who has lived in her home for 20 years, said she owed a total of $13,200 to CSKT Tribal Credit and the CSKT Housing Authority. Zimmerer said she didn’t know where she and her son, Susep, 17, who suffers from anxiety and bipolar disorders and Asperger’s syndrome, would live if forced to leave by Jan. 28. “It would’ve made it very difficult,” Zimmerer said. “Strange is very stressful (for him).” Zimmerer is grateful for the help. She noted that the CSKT transitional living center has a waiting list, and the Poverello Center in Missoula doesn’t take minors. Another example of a community- minded endeavor that Simmons has done is making gift bags for inmates in the Lake County Jail. Simmons, who manages the jail’s paperback library, said she made 55 gift bags for the inmates for Christmas. These included hot chocolate, fruit snacks, a can of soda pop, cookies and candy canes. The organization also has a goal of preserving natural resources, which is done through repurposing products and selling them. For more information, call 406-319-2525. New Hope Center Montana can also be found on Facebook.